I really like how they all came out. To give you an idea of size, each block finishes at 7" so some of the pieces in the blocks are really, really tiny, which is why I love paper piecing, because it helps make those tiny pieces easier. 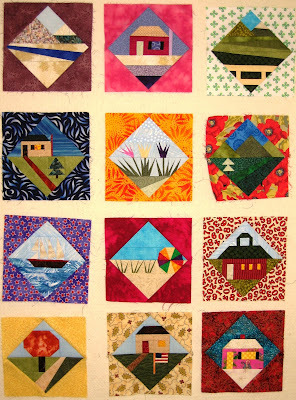 Reduce the number of un-quilted, but finished quilt tops. I currently have 9 tops that are complete and are just waiting to be quilted. I hope to have this number reduced by 2011. Now that I have my new machine with the fantastic BSR, I find machine quilting so much easier. My old machine was absolutely terrible at machine quilting. Buy less fabric and use more fabric from my stash. I admit it, I'm a fabric junkie. Hopefully I'll do better this year then I did last year. Reduce the number of UFOs I have going on right now. I have 9 quilts/projects that are already in the works (not including the 9 tops waiting to be quilted) and another 5 projects that I have picked a pattern and fabric but have not started them yet. Again, I hope to reduce these numbers as well. Maintain this blog. I think I've figured out that I'm a 1-2 post a week person, and there's not much more I can do about that. I don't sew every since I do work full time, which means I don't have things to update on a daily basis. That's it for me. Hopefully I'll be able to meet those goals, especially because they aren't too specific.